Renowned European master Michael Rogatchi has recently completed his important art series of large oil canvases Zion Waltz with which he was invited by the Ministry of Culture of Israel to commemorate the 50 th anniversary of the re-unification of Jerusalem in May 2017. In his interview, Michael Rogatchi is talking on his new art series, Jerusalem, Jewish people and the Jewish theme in his art. TJC: You have created your new Zion Waltz series of 15 large oil paintings in commemoration of the 50the anniversary of the re-unification of Jerusalem, which will occur in May 2017. Why have you decided to commemorate it in a way of ‘a concert’ as your series has so strong musical message in it? 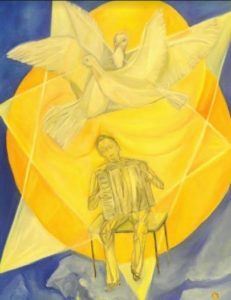 MR : Zion Waltz series of oil canvases was born as continuation of my previous series on the Jewish theme which also had happened to be musical one, Jewish Melody but was done in the different technique, as the mixed media works on the cotton paper. That series was created back in 2013 upon the invitation to participate with solo exhibition at truly special event, the IV World Litvak Congress in Vilnius, Lithuania. The timing of the Congress was chosen to commemorate of ever emotional for us date; it was the 70 th anniversary of the liquidation of the Vilna Ghetto. And my thoughts for the Jewish Melody were to commemorate this date not only by black silence, but by the Melody; by beautiful Jewish melodies which are singing and speaking powerfully, however sad they can be, against and despite any efforts to destruction of our people. We are in-tuned in those melodies because beauty, soul talk, reflections means life and memory, not death and destruction. Michael Rogatchi (C). Jewish Melody. Oil on canvas. 90 x 100 cm. 2015. The response by the public – and the Lithuanian public is very sophisticated and demanding in the best way – was so positive that instead of a month, the Jewish Melody was exhibited there for a half of an year. Later on, the series was shown, also very successfully, in Tallinn, Estonia, and was inaugurated there at the special event celebrating both the Day of Jerusalem and the anniversary of the splendid Tallinn New Synagogue. Later this year, we hope to bring the Jewish Melody and some my other works, to London, for the special pre-High Holidays exhibition at the great Western Marble Arch Synagogue known as ‘the London address of the World’s Jewry’; the synagogue where Rabbi Lord Sacks is administrating High Holidays, and where our dear friend brilliant Rabbi Lionel Rosenfeld, the leader of the congregation, is directing the fantastic Shabbaton Choir. Coming back to the Zion Waltz, I can say that when I started to work and think on the series to created for the commemoration of the 50 th anniversary of the re-unification of Jerusalem, the date which is so very special and close to my heart during all my life, the Jewish Melody, the principle and the motto of that series, in has developed into the new series, Zion Waltz. To explain the two core elements in the title – and the thought behind it -, the meaning of Zion does not need an explanation, I believe. It is the core of our belonging; it is both a physical place and the most powerful symbol of the covenant between the Creator and Jewish nation. It is also the proud symbol of the very essence of Judaism. Waltz – because of the perpetual character of the dance, and also because of its beauty, romanticism and its engaging character and power. Once you start to waltz, you just cannot stop, and, metaphorically speaking, dancing around Zion, it is what we, Jewish people, are doing non-stop, with love and unity. Looking back on the Jewish history, I do think that the moment of unity of the people who were receiving the Torah at the Mount Sinai, had been the most important quality and key-moment in our history. Thinking throughout our long and so dramatic history, I do think that the unity – or absence of it – had always been its core element at any stage of our long way. I do believe that every Jewish person shares a very special attachment to that moment, to the moment of the receiving Torah at the Sinai. I believe that this special feeling is present in every Jew, to different degrees, naturally. And even those Jewish people who does not recognise this feeling in their daily-life, they still have it in their sub-consciousness, I believe. This is what unites us all, this is the foundation of our unity as a nation, as the people. And this is what I meant to celebrate in my new series of works, the celebration of the core – and the source – of our unity. TJC: Why have you chosen to create your message in this series via images of music? To paint music is a very uneasy pattern, with a lot of pitfalls on the way of an artist. MR: I did not think about pitfalls, frankly. To create works on music in celebration of spiritual patterns or historical events has come rather naturally to me. Maybe, because I know, and I feel that music embodies the soul of the people. I am thinking on our shofar ( ram-horn trumpet) very often. I have several shofars at home, and even made one by myself. Shofar and its sound is such distinctive bond for us, Jewish people; if to think about it, it is simply amazing how a sound could become such physically palpable bond in important spiritual dimension. We know that shofar sounded tremendously at Sinai at the time of the giving Torah; we know that shofar sounded as the most important and critically timely messenger of hope at the moment of Akedah ( sacrificing of Isaac). We know that shofar sounds basically as a metronome of our lives, marking our annual circle every Rosh-Hashanah ( Jewish New Year). To me, a sound of shofar exists in any Jewish music, traditional or modern. It is there. It adds that special message which is so characteristic to our music. And for me it is important to connect the first sound of the shofar at the Mount Sinai with any sound of any Jewish music afterwards. There is no occidental that music always had and still has such central place in the education and upbringing of children in Jewish families. 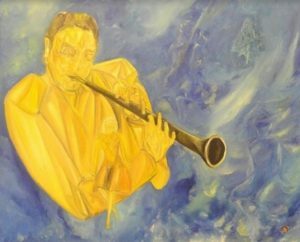 I can say that music has become a part of the Jewish psyche, and very substantial part of it – that’s why I am painting so much music in my works on Jewish theme and in general,too. Do you know that every Jew, would it be a man or a woman, do have his or her own nigun ( tune, melody)? Some people are aware with it, and some are not, but it does exist. In my case, as long as I remember myself since my very early age, I always had and still have my nigun. And I am often hearing my wife’s nigun even when she herself does not notice while she sings it, it often comes semi-consciously. I can tell you that everybody’s personal nigun varies as one’s life is going on, it changes. In the case of this personal, individual melody, it seems that the music originates from nowhere. Or rather, as if from nowhere. But I know that it comes from the Creator. It is given to the Jewish person as a signal of recognition on who we are. I am so ever grateful and am ever fascinated with existence of this beautiful, unique connection. I believe that music is a natural source where from many other essential patterns of life originates, and that’s why I never tired if painting it. TJC: Elie Wiesel once said that ‘a simple Chassidic melody is more important’ for him ‘than melodies of Mozart, Bach and Beethoven together’. How do you rely to that? MR: It is absolutely the same for me. We had a big honour to know Elie Wiesel, and to me, he is the one of the greatest men on this planet. I love music, and Mozart is my beloved composer who is also very important for me as for the artist. I have created a special image of Amadeus in early 1990s, and since then am working on this image in many of my works. I also love Vivaldi and Bach, and some other classic composers and the giants of modern music, as Piazzolla, for example. But Elie Wiesel said it for me, too: I simply adore Chassidic music. It gives me such a joy, unlimited joy, and it is crucially important for me as it speaks, sings directly to my soul. I have several works in which I tried to express this feeling and my gratitude to the kindness projected by the best of Chassidism, and I am very glad that the one of such works belongs to the family of our dear friend Rabbi Shmuel Kaminetzki, the one of the most brilliant Rabbies of our times. When you are listening Mozart – which I am doing it all my life, and am working while listening to Mozart, Bach and Vivaldi, but Mozart the most, – you are having a cosmos opened for you by his genius. And still, Mozart is very important, essential, but one element of your life, in my case, at least. Mozart, and the other great composers are self-contained cosmoses. But when you are listening to a simple Chassidic melody, it brings you into the world which is your life in generations. It is your world, and you are feeling it in a way that only your genetic memory can tell you about. Interestingly, in one of the Mozart’s concerts, I believe, in his Concert 26th for violin, there is one part very much resembling a part of the birkat hamozon (grace after meal) melody. I was very intrigued to discover this semblance. It would be write to say that all Jewish music as a whole is essential part of my life. Michael Rogatchi (C). Under the Skies of Jerusalem. Oil on canvas. 100 x 100 cm. 2016. TJC: Speaking on some works from your new series, we have seen quite different Jerusalem in your new work Under the Jerusalem Skies in comparison with Jerusalem from your well-known My Stones. Jerusalem work which is at the Art Collection of the Municipality of Jerusalem. Can you tell us about it? MR: Yes, it is quite different Jerusalem, and most likely, it is the sign of my own maturing and the way how I see the most important for me place in the world. But there is also some history in the first work that you’ve mentioned. My Stones. Jerusalem was created in mid 1990s when Hurva synagogue that was intentionally blown up in 1948 by the Arab Legion, had been not restored yet. That arch which was left of once largest Ashkenazi synagogue in Jerusalem and which stayed in the skies in so tragic exclamation, had never left my mind. I simply could not avoid creating that work which now is at the Art Collection of the Municipality of Jerusalem. But even in that dark and dramatic work, the main element for me there was the opening in skies with immense light coming out of there, and the sun with its mighty rays which was under the walls of Jerusalem. Fortunately, the Hurva Synagogue has been finally restored in 2010 – and Rabbi Kaminetzki has played the pivotal role in making it happened. Today it is the one of the most memorable sights of the heart of Jerusalem. It is also the beautiful sign of victory of our Jewish spirit. Twenty years on, I created the other Jerusalem on my new canvas. In this new work, there is a lot of light, there is encompassing gentleness, and there is also a lot of symbols. This is Jerusalem of joy and happiness – as we are celebrating the 50 th anniversary of the re-unification of the capital of our state. I painted twelve olives there as the symbol of our Twelve Tribes; there are very many faces you can find as if engraved into the unique Jerusalem stones; there is a ram from Akedah, too; and a semblance to the Hebrew letters. Everyone in this painting is united because we all belong to the same nation; everything there is inter-connected, and everything originates from the certain source in the unifying way. 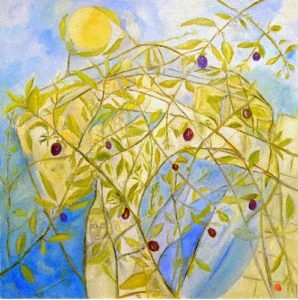 It is only Jerusalem olives’ leaves can embrace the sun, in my understanding. Such understanding gives me a joy which I tried to put on my canvas. It is very enlightened, youthful piece, I would say; the piece which tells on one’s love as it is felt in one’s youth – all is light, all is joy, all is nothing but unlimited gentleness, because it is with this kind of love we love our Jerusalem. 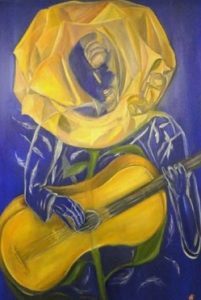 TJC: What about some other works in your series, all about music and its different genres, which be put together looks like a concert itself: such as Jewish Melody, Le Rose di Florese, Yiddish Tango, Kletzmerim? MR : Those works are portraying Jewish music and Jewish musicians, importantly. In Jewish Melody, the idea is to show that Jewish musicians are playing with such lightness that even a feather can withstand it. A feather is the one of my favourite metaphors, in general. I have painted it in my philosophical Who Said So? series; in my Italian series; and in my Jewish series, too, always with a different meaning and in different reading of the metaphor. In this case, I know that Jewish musicians do have unparalleled qualities. How can you describe what Maestro Perlman is doing on his violin? You cannot describe it, but you know that this is a spark of Divine presence in this music and this talent, and you know that he and Jewish musicians in general can easily play staying on a feather and flying on it. And we are flying with them. Michael Rogatchi (C). La Rose de Florese. Oil on canvas. 120 x 90 cm. 2015. As for Le Rosa di Florese, it is quite special work for me. The name comes from old ladino song. And this is my commemoration to the so very tragic destiny of the Spanish Jewry. My wife father’s family is originally from Toledo, back in generations, so it is quite personal for us, too. I would never forget what a terrible destiny fell upon that talented, intelligent, great part of the Jewish people, what has been done to them in Spain, with such animalistic barbarianism. I painted what I feel in this regard in my Spiral of Belief diptych, in its part 1, 1492.Toledo. This is the one of the darkest pages of the world history in general, I believe. But despite that sadistic attitude towards Spanish Jewry, such arrogant and willing destruction of them, their music, their language, their images, their heritage have survived. It is another miracle of our Jewish spirit, of our genetic code, if you wish – to survive despite anything. Le Rose di Florese, an old ladino song is telling on the beginning of a rose blossoming. And what is a rose in our tradition? The rose is as beautiful, as very important intellectually symbol in Jewish tradition. One can write a book about this subject along – as Rabbi Adin Steinsaltz did indeed, in his The Rose of Thirteen Petals classic, the one of my very favourite books. The stunning qualities of a rose are its phenomenal gentleness and its outstanding resilience at the same time, this quite rare dualism which also corresponds very much to the Jewish national character, as far, as I can see it. It is not only because a rose is my favourite flower that I love to paint it, as I did in the works on Esther, or on the works like Shavuot Rose, Yiddish Sun, Simcha Dance, Nissan Rose, or many others. I am doing it because of this essential symbolism. In the case of Le Rose di Florese, this work is my song in the memory of the obliterated Spanish Jewry. And it is not dark or tragic work, purposefully so; it is the work full of life and energy, and the eternal beauty which the beasts who did attack our people with such zealotry were simply unable to destruct. Michael Rogatchi (C). Yiddish Tango. Oil on canvas. 100 x 80 cm. 2016. Yiddish Tango is a love story. It seems that this genre itself – because love story can be seen as a genre, too – occupies a lion share in what I do in art. I just cannot help it. It is the way of one’s life, and it is the life of one’s art, as it was in the case of Chagall, or Modigliani, or those artists, writers and composers who were working primarily in that ‘genre’. In this work, Yiddish is a key-word for me. I do love tango and share this love with my wife. We both see the ocean of life – and love – reflected in tango music. And of course, Piazzolla who was a music genius, to me, is a giant of tango, and as a matter of fact, a giant of music. I completed a special series called Libertango. After Piazzolla in which I am trying to examine that larger-than- life phenomenon. Interestingly – and tellingly, to me – I have learned from Piazzolla’s biography that he said that he has learned the rhythm and the rhythmic varieties from the Jewish musicians whom he lived nearby with and whose music he listened a lot , would it be Jewish weddings or other occasions. I think that it is quite interesting glimpse into the Piazzolla’s world, the detail which has been largely overlooked. The Yiddish tango as a musical sub-genre is probably the one of my very favourite ones. It is so rich, complex, and emotional in the best, unsentimental way, and very beautiful, too. I feel as being able to create few more works reflecting on Yiddish tango – as I did also in I Love You Much Too Much work – and I think it is quite appropriate to include this work in the Zion Waltz series, because I tried to project in that work fine and complex internal world of our people. Michael Rogatchi (C). Kletmer Family. Oil on canvas. 100 x 80 cm. 2016. 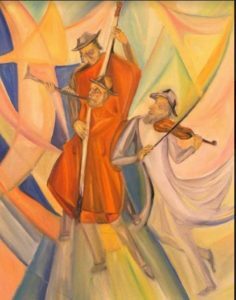 In the work Klezmerim ( Kletmer Family) three generations of the same family of musicians are depicted. The main message of the work is continuity, perpertuality, unceasingly thread – as in our Jewish music, as in everything it tells about. It is about the continuity defining the Jewish thread in general. 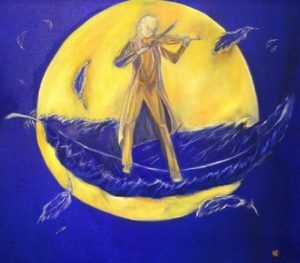 Because of my optimism, diue to this continuity, the work is so light, colourful and joyful, and the musicians there are as if flying in the midst of a joy. We have many things and reasons to celebrate, too, you bet. TJC: In your series, there is also a group of paintings which are devoted to different stages of life, one’s childhood, marriage, the birth of child, as if you are recreating a family life on canvas. Can you please tell us more about it? MR: I feel that I can do it indefinitely. Family is the core of life in Jewish tradition, and I am speaking about it not in an abstract way at all. Family, my family and my extended family has been always the nucleus of my universe, so to say; and I am painting it a lot. It is felt as very natural, to me. The work My Grandmother’s Songs is truly dear for me, and it is literally as it is done on the canvas, including my grandmother Sofia Litowsky-Reiss’s face which could be seen in the enlightened cloud in the middle and above the personages of all those songs which my granny sang for me and which I love and remember all my life. Michael Rogatchi (C). Lijuli-Lijuli. Lullaby. Oil on canvas. 80 x 100 cm. 2015. 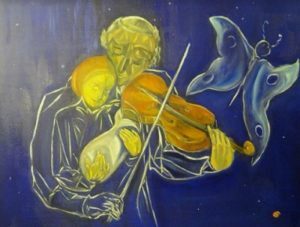 In another work named after Yiddish lullaby, Ljuli-Ljuli, it is my lullabies again although the work is depicting the Jewish family in its canon way and is more generalised as a picture. I think that an artist is truly lucky when he can produce a reflection originated from his own life into more general picture, relating to a larger phenomenon. When I am mentioning ‘lucky’, I do not speak about technical abilities, but on the fact that an artist has the material from his own life to reflect upon it while relating to things in more general meaning. One is very privileged in life to have that good material, with heart and soul of it; the heart and soul of one’s family which is the only nutrition in life which sustains us as long as we live. I do believe in it, and am very grateful to my wonderful family for this main heritage in my life. Two more works on this Life mini-series within the series, are the two parts of the Simcha ( Joy) diptych depicting groom and bride at the Chuppah, the Jewish wedding. The two parts of the diptych are contrasted each towards the other, because a contrast is the salt of our life, as I can see it. Why do you think Jewish weddings are so special and so different from the other weddings? Why wedding has such enormous meaning in the entire Jewish life? When Jewish couple get married, we are witnessing just uncontrollable joy during the whole event, and I created my Groom in the way we feel at our weddings. Such joy as you can witness at Jewish wedding, is only felt on the occasion of the birth of a child, but the latter joy is a bit different one, it is a bit more rounded and thoughtful, I would say. When I painted this Groom, I was thinking on King David, my favourite character in whole Jewish history, and on his famous dance before the Creator when he was just absolutely exalted with joy, even beyond controllable. I do feel that King David’s joy very closely, I understand it well. That was a joy of King David’s feeling of his closeness to the Creator and there is no feeling in the world which is anywhere close to that illuminating joy which is going inside oneself. In my work, it is also a joy of the Groom who is close to the fulfilment of the quite- essential part of our Covenant – that the Jewish people would become as many, as the stars in the skies. My Groom is dancing his joy out on the stage in his life when he will contribute to the reality in which Jewish nation will multiply and it will be strong. What can be more important and bring more happiness to a Jewish man? And the second part of the diptych portrays the Bride which in my work symbolises the best in Jewish woman: beauty and love, warmth and modesty, and just unlimited gentleness. I was also thinking on the most touching description of Shabbat in our tradition which calls Shabbat a Bride. Here it is, the Bride of Jewish Nation, the soul of Shabbat. Michael Rogatchi (C). Strength of Love. Oil on canvas. 120 x 100 cm. 2016. TJC: And what about two very distinctive works in this series, Strength of Love and Zion Waltz? MR: The work Strength of Love hardly needs explanation, I believe, but I am happy to share with you the sub-title for this work which I do intent to put on the display while exhibiting the work – “Do Not Even Thing About It!..” . As a matter of fact, I wanted it to be the work’s only title, but has made a compromise with my wife of keeping the line as a sub-title. 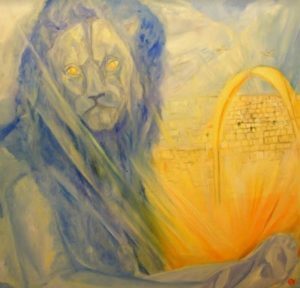 I did this work not only to emphasise once again the symbolic meaning of Lion of Judah as our eternal defence and the symbol of the strength of Jerusalem, but mostly, to emphasise the fact that this defence is ever present in Jerusalem; the reflection of this belief is a central element of the work. Jerusalem in this work is as if made out of pearls, it all shines. The thing is that for me, Jerusalem shines always, at any weather, in any season, at any time of day or night. Michael Rogatchi (C). Zion Waltz. Oil on canvas. 100 x 80 cm. 2016. The work Zion Waltz is dedicated to Leonard Cohen whom we were very honoured to know and who also knew our both’ works and appreciated what we do. On the wall in my study, there is a Cohen blessing hand-written by Leonard, with his famous heart-shaped Mogen David. I am watching on it and reading it with warm gratitude every day. It was an exchange of gifts between us. When I created the first version of Zion Waltz work for the Jewish Melody series, back in 2013, we have sent a special version of the work, in a bigger size, to Leonard as the present for his 79 th birthday. In his kind letter back, Leonard with his unbeatable sense of humour wrote: “Michael, I am in such age that I am pretty busy with giving things away to people. But not this work, my friend. It is very fine and exquisite, and I am honoured to have it”. And soon after, I have got his customary Blessing written and drawn by Leonard, the Blessing which I treasure very much. We love and admire Leonard Cohen greatly. I do think that he was unique man, and that he was the Gift, both the gift to the Jewish people, and the gift by the Jewish people to the mankind. I do think that Leonard was a super-rarity in the combination of things which are not necessarily easily compatible: gentleness and resilience, introvert depth and brilliant elegance in his so long performing life. I also think that it is very difficult to find more devoted Jew than Leonard was. 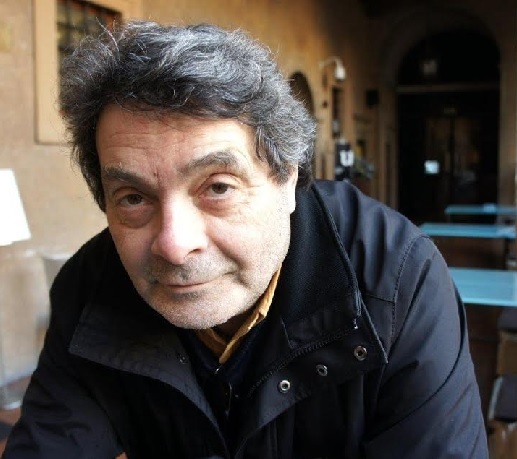 He was the real Cohen, the exemplary Cohen; the Cohen like a Cohen is expected to be. He was brilliant, lovely man. And I am very glad that I was able to dedicate my important work to him, and that the work is a title work for the series to commemorate the 50 th anniversary of re-unification of Jerusalem. I hope, Leonard would approve it. TJC: You are working as the artist, with serious emphasis on the Jewish theme, for almost 30 years. Have you changed as the artist during these years, in your perspectives, focuses, interests, techniques? MR: In my understanding, I am working as a Jewish artist in anything what I do, even in the works dealing with non-Jewish theme, because it is who I am. I personally am able to trace various aspects of Jewish themes, or Jewish perception, in all my works, and there are quite many works which are not depicting Jewish themes or motifs in particular. Yes, there are certain changes in style and vision which are coming with time, indisputably so. When one is young, it can be seen in his works in more direct and more powerful colours, in more straightforwardness of the works, in the more contrast way and a bit more simplistic lexicology of works. The life is seen with more clearness when one is young – or you are thinking this way, being unaware with what your experience will bring you with age. The age, as paradoxically as it might sound, brings more joy and more gentleness to the work of artist as I am experiencing it. It brings you the joy of every new day, and it brings you the kind of gentleness which is accumulated with your growing knowledge. This all leads to the different choice of colours, opting for not trivial ones and more subtle in shades. It makes your way of thinking and reflecting more complex, invariably, and it makes you to be interested in more inter-connections which results in more complexity of the works. I t would be fair to say, perhaps, that your work reflects your experience and your personal development much more than we are ready to admit. For the artist, his canvases are always his mirror. The point is that your mirror would have positive qualities. According to the Talmud, mirrors contain the quality of their owners. And I am trying to remember about it always.